AmarSabyasachi had been invited by MKK USA & Konark School of dance for performing handshadowgraphy in America . They have performed at University of Maryland Shady Grove campus, Largo Community Hall Maryland , New Jersey , JB School- New York , Potomac and received wide acclaim. 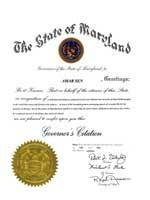 The duo received special citations from Governor of Maryland. The event received rave reviews in media in USA & India that this art form has never been seen before in USA . The way the AmarSabyasachi presented the show, it was fantastic & unbelievable. © HandShadowGraphy.com, 2002, All rights reserved.